Essential oils have all kinds of benefits for dogs and humans alike. That’s why Wondercide products go beyond their great scents; they’re actually formulated with therapeutic-grade essential oils that have positive effects for pets and people. While there are tons of different oils that offer everything from relaxation to healing, we narrowed in on 8 essential oils for dogs that can work wonders for their well being. We also talked with therapeutic-grade essential oils expert Blanca D. In addition to sharing some of her favorite essential oils for dogs, Blanca offered great advice for effectively introducing your pup to essential oils in the first place. Like all new experiences for your dog, you should go as slow as possible when adding essential oils into her routine. Begin by holding a bottle of essential oils in your hand with your dog in the same room, allowing her to approach the new item and building up to letting her smell the actual bottle. Dogs are scent-driven animals, and you don’t want to overwhelm them with too much too fast. When she is used to the idea of the oil, you can diffuse it with a water diffuser, opting for aromatherapy before you move onto any topical application. Blanca advises that it is ideal to begin essential oil therapy to help your dog feel good, rather than starting a routine when you are trying to resolve an issue. She approaches essential oils with a positive attitude. 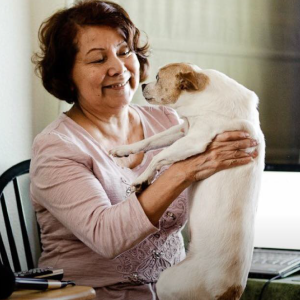 Blanca explains, “Instead of saying, ‘How do I get my dog to stop being aggressive?’ Ask yourself ‘How can I bring my dog more peace and calm? '” That’s how you will get the most out of essential oils for dogs. 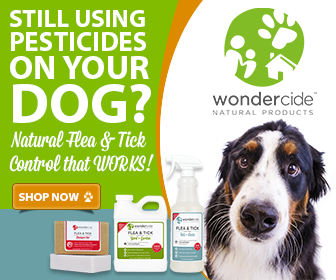 Cedar oil (also known as cedarwood oil) is the active ingredient in Wondercide’s line of flea & tick control products. In addition to repelling pests and killing them when combined with the inactive ingredients in Wondercide, cedarwood has a relaxing effect on dogs and supports healthy skin. 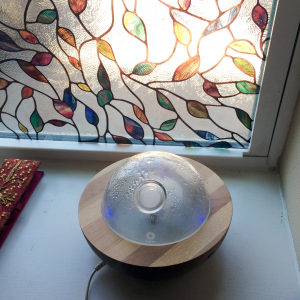 It can be used effectively for pets in a water diffuser to calm them. If your dog acts sleepy when you apply Flea & Tick Pets + Home to her skin, she’s responding to the aromatherapeutic quality of the cedar essential oils. Lavender, found in many of the Wondercide skin care products, is an excellent starter oil for dogs that are new to essential oils. It is considered one of the most versatile essential oils, creating a sense of peace and harmony and offering a calming effect for dogs (and you, too!). Blanca suggests using therapeutic-grade lavender oil any time your dog will be in a stressful situation (like travel or a trip to the vet) and while training them to quell their hyperactivity. If you’ve ever used Wondercide’s lemongrass + cedar scented flea & tick control, you’ve already experienced the benefits of therapeutic-grade lemongrass essential oils. There’s just a small amount of the oil in our products to create that very pleasant citrus smell, but it is actually off-putting to fleas and ticks and can improve the condition of your dog’s skin as well. 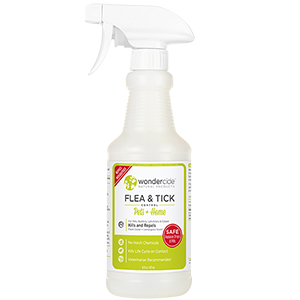 Another insect-repelling essential oil, citronella can be found in Wondercide’s Flea & Tick pet shampoo bar. Diffuse therapeutic-grade oil instead of using those store-bought citronella candles, and wash your dog with our shampoo bar in the summer for added anti-flea & tick power. Frankincense is a safer and less potent oil used in many aspects of pet care, from wound care to behavior improvement to antibacterial healing. It’s a great all-around oil to use with your dogs. Blanca explains that Frankincense quiets the mind and that Egyptians once used the ancient oil in mummification in order to elevate the spirit. Peppermint oil is a great reliever when dogs are overheated. It can be used on long hikes and added (in a tiny quantity) to drinking water for internal cooling. As an analgesic, it can be used for acute injury as well. Peace & Calming is an essential oil blend that Blanca used successfully with her most recent dog Penney Lane, a chihuahua mix. Penney was a hyperactive dog who benefitted from the relaxing qualities of this oil blend. It’s meant to be used for fear, anxiety, behavior issues, car rides, and excitement. Like lavender oil, it can be used in any times of stress and in new environments to help build your dog’s confidence. It is useful when diffused or applied to something close to your dog, like their collar, blanket or toys. Blanca also suggests the essential oil blend Valor, which helps with fear, behavior, and training. It can also aid in the healing of skin masses, itching, allergies, and infections. Try it in a diffuser, on your pup’s collar or with topical application. About Blanca D.: Blanca has a Master’s in Education and a Bachelor’s in Comparative Linguistics. She turned to whole food nutrition after a bout with cancer in the mid-’80s. She eventually used this newfound knowledge to switch careers and to become a therapeutic-grade essential oils expert, which she has done for the past 20 years. Her studies have included everything from studying Chinese herbal medicine to Live Cell Microscopy. Through her work with live blood analysis, she awakened to the powerful healing capabilities of organic herbs and therapeutic-grade essential oils. Her subsequent focus has been on the study of herbal remedies and aromatherapy for transforming the physical, spiritual and emotional body. I have a dog with a fatty tumor and I heard that frankincense therapeutic essential oil is good for that. I was thinking of order it but I do not know how to properly use it on a large dog. Can you tell me how it helps animals with cancer or fatty tumors and how to dilute and how much to use? Great question, Bonny! Frankincense can be a great essential oil for dogs. While we use therapeutic-grade essential oils in our products here at Wondercide and are happy to help you use any of our products, we are not able to advise on exact usage and dilution of straight essential oils. Hi Bonny, It’s been 2 years since you posted your comment about your pet having a fatty tumour and you also mentioned the possibility of using frankincence oil. I was wondering if you ever did use this essential oil, and if you did, did you get positive results. My dog has these tumours on both her back legs and I am searching for treatments on the internet. Our vet has her on steroids at the moment, but there has been talk of operations to remove the tumors. Really don’t want to go down that path. Any information you could supply would be appreciated. Cheers. Linda. Hi, everybody. I am a member of Young Living. They are the specific oils mentioned here. I can help you order your own essential oils collection. Just email me your name, and I can email you info on how to sign up and save 24% on every order, just like me. I am NOT a doctor and I can not prescribe or diagnose ailments. I CAN and will share my personal testimonies with you. I look forward to connecting with you soon. Be Oily. Be healthy. Be blessed. Thanks for your comment. If you have any advice for the commenter above, Bonny, who is interested in using essential oils for her dog, please feel free to comment about it as well! Do you use essential oils on cats too? Hi, Abbie! For the most part, straight essential oils are toxic to cats. The cedar oil used in Wondercide has been specifically formulated to be safe for both dogs and cats, and all the phenols are removed. There may be some therapeutic-grade essential oils that can be used for cats either through aromatherapy or topical applications, but definitely check with a holistic veterinarian for more information! Toxic to cats if they just smell it on us or applied directly to them? Essential oils that are toxic to cats contain phenols that their livers cannot process, so generally the biggest issue would be if they come into contact with the oil directly. However, it is recommended to consult your pets’ veterinarian before using any new essential oils either on OR around your animals. Hope that helps! A certified aromatherapist told me Blue Tansy is toxic to dogs. Is this true? Should I stop using peace and calming near my dog?? If this is true, I don’t want to hurt my dog. We interviewed an essential oils expert for this blog post, but we don’t use Blue Tansy in any Wondercide products. For specific directions on the use of Peace & Calming for pets, we’d recommend reaching out to Young Living or a holistic veterinarian. Hope that is helpful! In terms of the anxiety, Blanca, the essential oils expert whom we interviewed for this post, mentioned having success with the Peace & Calming essential oils blend for aromatherapy. You may also consider talking to a dog trainer who’s experienced with anxiety or even your Wonderpup’s vet. For his skin condition, you may find Wondercide Skin Tonic Spray useful, as it has great soothing power. We also have a Hypoallergenic Shampoo Bar he might like. For reducing inflammation, both Fidoplex (made from egg shell membrane) and Neem Bark Powder have anti-inflammatory properties. If you have any other questions, please feel free to email service@wondercide.com! Could you tell me what brand off vitamins you use for your dog’s coat? We just put a little bit of coconut oil in our dogs food. In about a month his fur is velvet like. Before it was pokey. He is a sharpei. My five-year-old hybrid service dog is epileptic. Approximately every three months she has three seizures one on top of the other. This last bunch on her third she started to roll from side to side and defecated. She had never done those before. She also arched her back and neck very stiff and stared un-blinking at the ceiling. Of course, I stay right at her side and reassure her. I have had her on the sodium bromide I believe it’s called. The vets want around 400.00 for level tests before they will renew the prescription. I have done a great deal of research on the internet and learned about frankincense. I used as recommend, base of neck, and one person said they also put a drop between dogs toes. That last one I wondered about licking. I tried both and nothing bad happened. Tonight I did the same procedure but in a few minutes she was trotting around living room and it was obvious her front paw were uncomfortable. I started soacking in water, calamine lotion, a lanolin-based cream like vasoline called mushers, then ice. Thank god, the ice seemed to help. It was a terrible experience. I need help. She is still going to have seizures in two months three weeks appx. This and the seizures are going to give me a heart attack! Seeing her in either state was torture. Our bond is very deep due to her being my physical stabilizer. Hi! I know this is a very old post, but I was reading up on the oils and saw yours and decided to respond. If your vet has not told you already, you need to try to get your dog on a diet that has no wheat, beef, or corn in it. (My poor Oscar is very allergic to corn products, and they would cause him to go into a cluster seizure.) If your vet has not added on any drugs, Keppra is a life saver, but it is very expensive through the vet. Fortunately you can get it through most human pharmacies for much much less (and generic). It has worked wonders for my dog, he has not had a seizure since October, of 2016 (knock on wood). Also, having a bag of ice handy for when she has a seizure is important, if you settle the bag of ice on the lower half of your dog’s back it’ll help pull them out of the seizure faster. My prayers are with you and your dog! I hope you’ve found ways to cope. I hope your dog has found a relief from the seizures since your question was posted in 2015, but I just wanted to reply and provide another option. I volunteer with an animal rescue (foster cats and serve on the board of directors). One of our volunteer foster parents and fellow board member fostered a dog that had frequent seizures and she was recommended Cannepet, a CBD oil specially formulated for pets. Within a month (I think it was) the dog’s seizures completely stopped and she was able to be adopted. The volunteer then recommended Cannepet to me for a cat foster I have with neurological issues. Every few weeks Maxx becomes aggressive then goes into a period of lethargy and just perches in one place for about 24 hours and sometimes head presses. His bloodwork during these episodes is 100% normal and the vet suspects he may be having seizures. I started him on CannePet and his episodes are down to a minimum and he no longer becomes aggressive (which I believe was just a response to not feeling well and protecting himself). I highly recommend at least trying it. I use essential oils but I am very careful not to use them around Maxx as I have heard cats and dogs with a history of seizures are very sensitive to some essential oils and they can actually make their symptoms worse rather than help. Of course you should always consult your vet prior to introducing anything new to your dog but I’ve only heard of and seen good results from the product. Please reach out to me with any questions. you say that you above “At Wondercide, we are very familiar with the therapeutic-grade essential oils we use in our natural products, but Blue Tansy is not one we’ve used” but yet you promote Peace And Calming from Young Living which contains Blue Tansy? No problem, Barb. We interviewed an essential oils expert for this blog post, but we don’t use Blue Tansy in any Wondercide products. For specific directions on the use of Peace & Calming for pets, we’d recommend reaching out to Young Living or a holistic vet – Hope that clears things up! I realize this question was posted quite a long time ago, but I wanted to share info. on the Blue Tansy concern for pets (and people): Sometimes confused with Tansy oil (Tanacetum vulgare), Blue Tansy Oil (Tanacetum annuum) is non-toxic and wonderfully powerful in aromatherapy. Tansy Oil is toxic and should never be used for aromatherapy purposes. The distinction is very important and should be noted. The Young Living oil Blue Tansy and those like Peace and Calming, JuvaFlex and others that contain Blue Tansy (Tanacetum annuum) is safe. Hope this helps alleviate any concerns over it’s use. I am a YLO distributor and would be happy to help anyone with information or making an order. God bless! Thank you for this info! I was about to use an essential oil in my diffuser which contains Blue Tansy as one of the ingredients. This is the first, very specific, answer I was able to find.regarding it in my diffuser with my dog nearby. My dog has a torn acl and I was wondering what oil would be safe to help with the healing process? Sorry to hear about your dog’s ACL tear! Office dog Kiley also tore her ACL when she was younger. In terms of essential oil therapy, we’d suggest consulting an essential oils vet like Dr. Shelton at oilyvet.com. Best of luck to your Wonderpup during the healing process. While it’s a long road to recovery, it can also bring you closer as you spend more quiet time together. I read and was told by my vet that Ylang Ylang was poisonous to dogs. I read here that it is mentioned as an essential oil that was good for them. Does that mean it is beneficial when inhaled but poisonous to them if consumed? How would one use ylang yang safely? When we interviewed an essential oil specialist for this blog, she explained that she has successfully used Peace & Calming (which contains Ylang Ylang) for aromatherapy only with her dog. She suggested using an essential oil diffuser but also definitely starting slowly so your dog can get used to the scent. Please do consult your vet or an essential oil expert for pets for specific instructions before introducing new essential oils into your pet’s routine. Hope that helps! Cinnamon, citrus, mint family (pennyroyal, peppermint, spearmint, wintergreen), pine, sweet birch, tea tree (melaleuca), and ylang ylang are all toxic to dogs topically or if ingested. As always, consult with your vet/a holistic vet, do your research, and even seek out a certified aromatherapist. Many of these “DoTerra” and “Young Living” reps are not certified aromatherapists and aren’t fully educated on the toxic effects of some oils when it comes to pets and or people with certain medical conditions. What about Vitality? Are they savvy on what dogs can tolerate oils in a defusier? ​Its great that you’re checking to make sure the products you use are safe for your pets. We’re not familiar with Vitality and recommend you get in touch with them directly to ensure your question is answered! and you are an expert? i’ve used peppermint oil diluted on my dog’s ears for while for the heat while walking. no problems! Numerous companies use tea tree oil in their products, dog shampoo etc. As long as it’s diluted with other ingredients it’s fine for dogs. I love essential oils and I use them a lot for myself. I specially use lavender and frankincense for relaxation and anti-anxiety. My little yorky has tons of anxiety and sometimes I wonder if its partly cause cause of me. I started giving him lavender and frankincense in hopes to help him less crazy than me. Hi! I love the information on your site!! My friends dog has bladder cancer. I was curious if Frankensence could help? Would it be best to use a diffuser, or use topically? Thanks so much! Thanks for the kind words, Melissa! Sorry to hear about your friend’s dog. We’d suggest consulting a veterinarian well-versed in essential oils use for pets in order to determine the best mode of action for your friend’s dog. As per our interview with essential oils expert Blanca, introducing new oils to pets can be easier if you begin with simply allowing them to sniff the oil & become accustomed to it, and then use a diffuser. You can then work up to whatever protocol you develop with a veterinarian. Ok, I appreciate all the information in your article. I am wondering if you could shed some light on a reaction my dog has had to frankincense. My mother had applied it to her foot for a small injury and when she walked into the room, our large dog (Rhodesian ridgeback) began to rub on her feet and roll on the ground and lick her feet. He did this again and again for several minutes just like some kind of puppy in love. It was so funny! That does sound funny! Maybe he was benefitting from the aromatherapeutic properties of Frankincense. You could always check with a holistic veterinarian for more guidance. Hope that helps! True! Thanks for pointing that out! In the interview featured here, we discussed both individual essential oils as well as blends. My English bulldog gets Interdigital Cysts on his paws…do you have any ideas on which oils to use? I have soaked it with Epson salt and put the YL Mendwell on it as well as Thieves. We recommend using either our Skin Tonic Spray or our Skin Tonic Oil, as the main ingredient, Neem oil, is great for soothing and healing sores. All of the essential oils in this product are therapeutic grade and will aid in your pup’s paw’s healing process. Both products include Organic oils of Neem, Karanja, Jojoba, Coconut, Vitamin E, with essential oils of Lavender, Cedarwood, and Lemongrass. I have a 7 year old pit bull mix that within the last 6 months has starting licking her paws until they are so red. I was told that peppermint oil, diluted with water is a good remedy for this. Is this true? With essential oils, it’s best to discuss with your vet first. For itchy paws, you could certainly try Wondercide’s Skin Tonic Spray, which uses neem oil to treat the source of the itch and quickly relieves discomfort. Hope that helps! Please let us know if we can assist with anything further. Beautiful rescued Flat Hair Retriever was perfectly fine. For the last year has been itching everywhere. There is no crust, flakes, redness or patches of open skin but itching is very intense and general (not a specific area). Have been giving 1/4 of prednisone pill every other day but this is a terrible option. Persuing change of diet but need other help. Can your natural products help general allergy? Thank you for your question! We’re sorry to hear about your Retriever’s discomfort. We’d recommend having a look at our Skin Tonic Spray for your pup. It’s a non-toxic spray which helps alleviate environmental allergies, hot spots, itchy areas, and heal + soothe dry flaky skin. The product is non-toxic and even safe if your dog ingests it through self-grooming. We also sell samples of it HERE. Let us know if you have any additional questions for us along the way, we’re always glad to lend a paw. Just to be clear, we DID NOT OPEN the tumor, it did that on it’s own. I have a dog that itches a lot what can I use on him to stop itching, no fleas. or ticks I have tried a lot of things. Hello, Melinda! We’re sorry to hear about your itchy dog. We know how hard it can be to see your pup suffer. Itching can also happen as a result of allergies, and we would recommend trying Skin Tonic Spray to offer him some relief. It’s also important to feed high-quality food and make sure to wash your dog with a gentle shampoo like our soothing Pet Shampoo Bars. We hope this information helps and you can get your pup back to feeling like himself soon. Regards! i have a Chihuahua that has the hacking cough when he is excited. Not sure about Collapsed Trachea?? however, I will treat it as though it is. 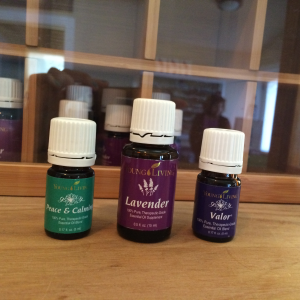 What essential oils would you suggest to alleviate the cough as well as vitamins. I use Wondercide shampoo bar and flea spray and love it. Wondercide doesn’t make vitamins for pets, but we do offer a line of amazing natural supplements for dogs and cats. To support wellness, we offer DETOX Ultra-Pure Bentonite Clay and Neem Bark Powder. Both can be administered orally to dogs (and cats) to promote a healthy immune system. We hope this helps, but please let us know if we can answer any other questions! I know this is an old post but just read your comment. My moms dog had the same thing and they treated for allergies, colapased trachea and finally did some other tests and found out she had an enlarged heart which is common in the breed. She is on meds for this and doing much less coughing. Hope this helps. Hi, I have a 15 year old shih Tzu that has had a severe bronchial issue with a dry cough for about a year, we do all the meds, breathing treatments, tried Chinese herbs and acupuncture too… but last night I realized that I had some lavender residue on my hands and I petted her, she started breathing differently!! Your site has been very informative, and just signed up with YLO… desperately awaiting Valor to arrive, but she hasn’t reacted to much diffusing! So I was wandering what should I mix up, and how week should I mix it to be effective without compromising her elderly organs? What do you suggest? Btw… her name is “Miracle”, so i am hoping for a valid Miracle to happen! ? We hope Miracle continues to improve. You’re doing so much good by choosing natural pet care for her. She is lucky to have you. Cheers! While we don’t know the ingredients in other brands of dog shampoo, we can say that the quality of oils used and properly diluting essential oils are very important factors in considering their safety. Choosing a manufacturer you trust is a great way to find the safest options for your pup. Wondercide’s Flea & Tick shampoo bar contains less than a quarter of one percent of citronella, and we use the highest-quality oil: therapeutic-grade and phenol-free. We work closely with both holistic and traditional vets to formulate our products, and use only oils (and other ingredients) we know to be safe for pets (dogs and cats) and people too. The oils are properly diluted and the amount we use helps give the bar its repellent qualities. As a natural shampoo, the product is designed to be rinsed off after bathing, and does not enter into your pet’s bloodstream. Our bars rinse clean as well, and are an excellent, safe option for you and your pets! Let us know if we can answer anything else for you. Cheers to you and your furbaby. I have a 4 year old English Mastiff that has been diagnosed with Wobblers syndrome. Has anyone else ever used any essential oils for this condition? If so, what would you recommend? I have heard maybe frankincense? Any suggestions would be appreciated, he is deteriorating quickly. We’re so sorry to hear about your Mastiff, Ina. We hope you are able to find safe, natural solutions that can help with this condition. While we do use the highest-grade essential oils in our products, we do not have individual oils for sale, and would not be able to recommend a specific one for Wobblers. That said, if you are looking for holistic solutions, we’ve heard that acupuncture (along with canine chiropractic) can help with pain management for this condition. There’s a great holistic veterinarian finder that you can access HERE courtesy of the American Holistic Veterinary Medical Association, that might be able to point you in the right direction. We wish you the best of luck in finding the right solution for your pup. Our dog, now going on 11, had fatty tumors and cancer which was presenting itself in the way of sores, some that looked like raspberries, on her feet. We began putting 3 drops of Frankincense in her food 2X a day. She ate her meals like normal, and she hasn’t had anymore sores. She is healed up nicely and doing great! BTW, she weighs 68lbs and is a Lab. Thank you for sharing your story Patricia! Its so great to hear you found a natural solution to help your sweet Lab overcome those tumors, and we hope others can benefit from your experience. As always, we recommend pet parents interested in using essential oils consult with their holistic veterinarian for more information about what oils are appropriate to use for their pet’s specific needs. how long did it take your dog to recover or better said how long did you have her on the treatment. My boxer has the same and I started treating him with Frankincense oil as well. that’s why it’s called the king of all oils! My Cane Corso Mastiff who is almost 10 yrs old, has a bad case of bacterial MRSA which started in his ear canal. Very expensive medication has not helped. I refuse to put him to sleep. He’s still eating good. Can I use Frankincense in his water? Will that help to ease the infection? His right side of Face swelled so bad that it opened up and puss and fluid now oozes out. I’m willing to try essential oils if they can help him. We’re so sorry to hear about your sweet Mastiff’s condition. It sounds like your boy is dealing with a very tricky condition, and we want you to find solutions that will help make him more comfortable. Reaching out to a local holistic veterinarian (you can find a list HERE, courtesy of the American Holistic Veterinary Medical Association) can help point you in the right direction regarding use of EO’s and your boy’s care. We also offer two great products that may helpful to him. Our DETOX Ultra-Pure Bentonite Clay and Neem Bark Powder can be administered orally to dogs, and promote immune health and aid in the body’s natural detoxification process. Please let us know if there is anything we can do to help. We’re here for you! Bunny, I have a St Bernard that had a large swollen area on his kneck. So big I thought about taking his collar off. I started using CBD oil internally. Slowly progressed to 650 whatever’s twice a day. I did this for about 3 mths. The spot is completely gone. As well as all the other ones beside one. He weighs 101 lb. I added it to some cheap lunch meat. He took it right down. Good luck. It is definitely worth a try. I have just been handed a GSD WITH LARGE LUMP ON LEG. where did you get CBD for your boy? In UK somewhere. .? Don’t know which to trust. I have heard mixed reviews about using orange, or other citrus oils around dogs. can it be harmful to dogs?? Great question! There is a good deal of misinformation out there about the use of essential oils. While we know the two most important factors to essential oil safety are purity and proper dilution, we do not use orange oil in our sprays. This was a guest post by essential oils expert, and while we support their knowledge and opinions,if you’d like further information we suggest discussing with a holistic veterinarian who is trained in essential oil use. If you aren’t already working with an holistic vet, you can find one at ahvma.org, theavh.org or pivh.org. They can best guide you on how to keep your pet safe and healthy. A vetiver oil,cbd oil, clary sage may balance her hormones if she is not fixed.they can be more dominate if not fixed too,so I’d try clary sage also. My 13 year old Lab has some sort of skin tags on the outside of her eye, is there an oil safe enough to put near her eye? Skin Tonic Spray and Oil can be applied on the face and around the eyes. Spritz or apply in your hand and use your thumbs and fingers to gently apply around the eyes. Make sure to avoid getting any product in the eye itself. If so it can be washed out with water. Skin Tonic Spray and Oil are designed to soothe and heal skin irritations from a wide range of underlying causes and is naturally antibacterial and antifungal. You are welcome to apply to the area with the skin tags, but we do not have any testing or evidence that our products can be used to eliminate skin tags. For more information please reach out to your current animal healthcare provider or a holistic veterinarian in your area. ​Please let us know if you have any additional questions. We’re here to help! Great question! We don’t have a pure lavender oil product for calming, but hopefully one of our other customers with experience can give you some insight. Because each pet’s needs are different and pure essential oils almost always need to be diluted when used on our furry friends, talking to a holistic vet or certified aromatherapist about proper use is a good idea. If you aren’t already working with a holistic vet, find one at ahvma.org, theavh.org or pivh.org. They can best guide you on how to keep your pet safe and healthy.